The Thai snow sculpture team has brought fame to Thailand again this year of 2019. 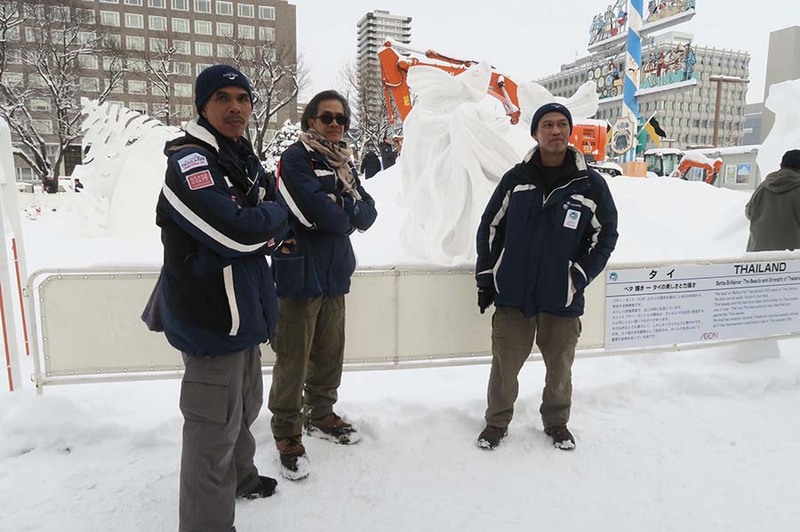 The Thai ice sculpture team has again brought back the No.1 win from the Sapporo International Snow Sculpture Championship from Japan. This is their 8th win in a row from showcasing their amazing abilities to sculpt ice, even though the weather in Thailand it is either hot or very hot. 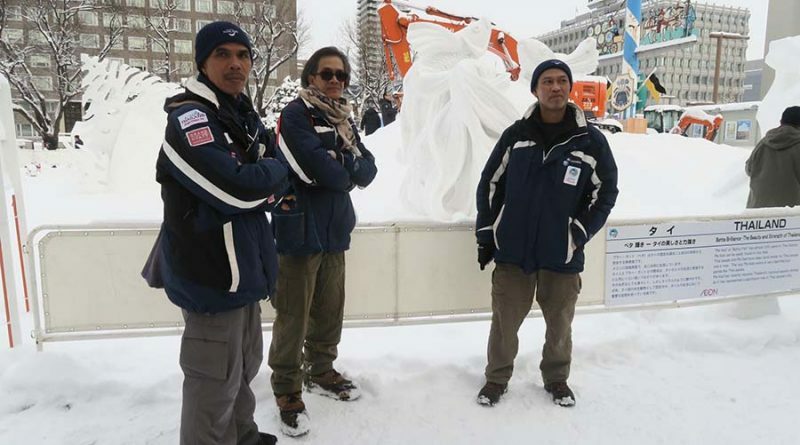 This year, the Thai snow sculpture team crafted a magnificent ice sculpture of three Siamese Fighting Fish. The Facebook page Hokkaidofanclub shared the great news online. The page posted that there are three Thai men in the team. The first member is Kusol Bunkobsongserm, his nickname is Too and comes from the Shangri-La hotel in Bangkok. The second member is Amnuaysak Srisuk, his nickname is Song from Surin and comes from the Grand Hyatt Erawan in Bangkok, This is Song’s 3rd snow sculpture win. The third and last member is Kritsana Wongted. Kritsana reported to the public that he is currently a freelance sculpture. He had planned to open a sushi restaurant but has not done it yet. 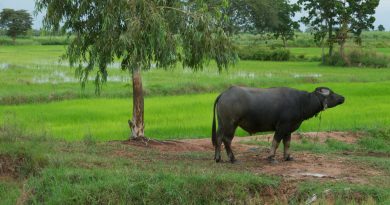 He is currently living in Lopburi and doesn’t remember exactly the number of championships he has won. The three men sculpted the ice statue of three Siamese Fighting Fish (Betta fish) around an ice globe. The Siamese Fighting Fish is also Thailand’s national aquatic animal. The amazing ice sculpture ended up with the win of the 46th Sapporo International Snow Sculpture that took place from the 4th to the 7th of February this year. 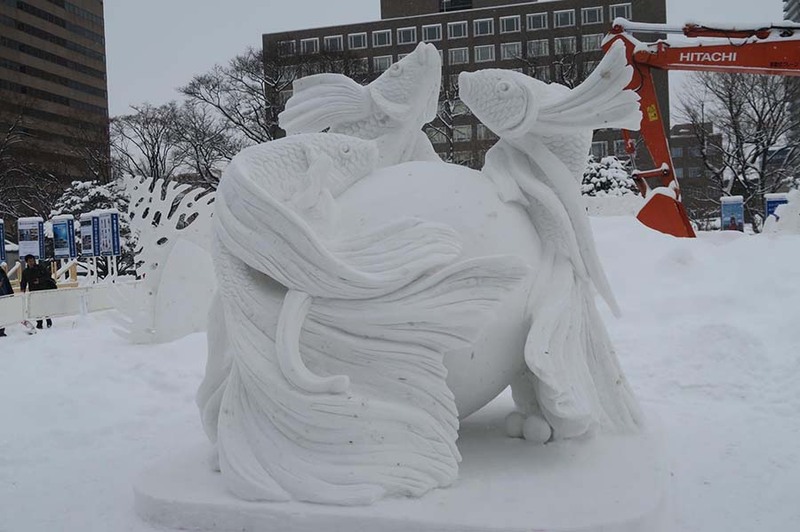 The 46th Sapporo International Snow Sculpture Championship is a part of the 70th Sapporo Snow Festival in Sapporo, Hokkaido, Japan. This is the 22nd Championship where ice sculptures from all over the world come in to compete on which team is the most talented. They are judged on the snow sculpture created at the event. This has been the 8th win in a row for Thailand. Thailand placed 1st in the Championship followed by Makao, China, Finland, and South Korea. Other competitors included Hawaii(USA), Indonesia, Poland, and Singapore. FB Caption: Thailand placed 1st in the Championship followed by Makao, China, Finland, and South Korea. Other competitors included Hawaii(USA), Indonesia, Poland, and Singapore.